Man With “Terminal” Lung Cancer Cures Himself With Cannabis Oil.Darren Miller was 50 years old when he was told he had (at most) 1 year to live due to inoperable lung and pericardial sac cancer. His befuddled doctors told him he was cancer-free. 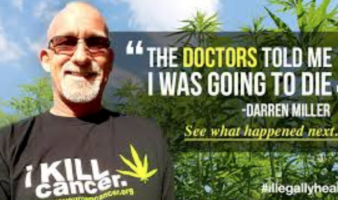 Fast-forward to 2 years later and cannabis oil for lung cancer treatment has cured him.